The Ninja Tortoise (Testudo ninjaum "ninja tortoise") is a tamable monster that is highly skilled in the martial arts. Ninja Tortoise is a cousin of the Ninja Turtle that has endured many hardships, trials, and losses. 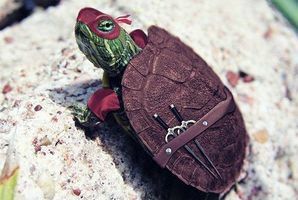 Ninja Tortoise preferred to learn martial arts on its own via travelling around the world. It has been known to hold black belts in Karate, Taekwondo, Aikido, Kenjutsu, and Judo. It also holds black belts in Ninja-Do and Ninjutsu, some of them even in Ikebana and Origami. Can be found training in forests or by streams. However the Ninja Tortoise can only travel at 1cm/sec and act as a burden to its owner at times. What it lacks in speed, it makes up in static electricity, and biting- once it manages to get close enough to the enemy, of course. It often uses a secret tactic called "snuggling up to the enemy" to gain its trust and have it lower its defenses. Favorite foods include: pizza, pizza rolls, pizza bagels, and pizza tofu. The mating habits of the Ninja Tortoise remain a mystery, but the subject is being researched as we speak by cryptozoologists all over the world. The documentary will be released in the near future. Rumored title: "Finding the Ninja Tortoise out of its shell". Carefully looking both ways before crossing, the heroes go south. This room has a bunch of empty pizza boxes, a tortoise shell and a rat skeleton. Contriving, the group can move to the west and north. Can make "Pizza Style: Rasen Pizza jutsu!" Very slow. It is recommended to carry it in a satchel. If a television is around, it will become distracted. It's allergic to moldy pizzas. Don't mutate it. This is not a TV show. Sensitive, it does not have a TV series. While walking through a meadow I came upon a sweet melon patch. Within the patch I could hear distinct rustling, wrestling and the chomp of some beast savoring crisp melons. There, oblivious to my presence, a Ninja Tortoise. I know this animal from stone carvings Papa made as fashionable amulets. I believe this may be a suitable beast to domesticate and assist me in what is becoming a hazardous journey. The tortoise is so involved with consuming the succulent melons that it is unaware of my presence. I crouch behind a shrub, observe, and devise a strategy to subdue it. The tortoise easily tears through the tough melon skin with its beak-like mouth. Once the golden fruit is exposed, the Ninja Tortoise thrusts its snout into the fruit and then it’s entire head. It snorts for air, chomps, chews and swallows with satisfaction. Once room is made within the melon, the tortoise tears at the fruit with its clawed front feet. Melon fruit flies through the air in every direction. I believe I can overwhelm the tortoise as it pokes its head into the melon. At that moment of vulnerability it will be blind to my movement so that I may grasp it by the shell, turn it on its back, and lay a heavy stone on its chest to disable it. A fine plan! The first step of my plan goes well; I approach the temporarily blind tortoise without detection. However, the moment I touch its shell to flip it over, it pivots with blinding speed to gash both my forearms with its claws. It dawns on me that I should have waited and observed a little longer in developing my strategy. What was a moment ago a blissful tortoise deep in enjoyment of a favored fruit, has become a vengeful beast bent on exacting revenge for my disturbance. My strategy is quick becoming obsolete, especially in the absence of gloves and bracers. If I could retreat gracefully, or more importantly without further injury, I would certainly do so. But the ill-tempered little terror will have nothing of my reconsideration and I believe wishes to make a domestic assistant of ME! My shield! Of course, I can use my shield to fend off its tearing blows, and hopefully subdue the beast. I will guide it back to the vicinity of the large stone with my continuing strategic retreat, then pounce on the tortoise with shield inverted! Oh please Star Stuff, let this alternative to death work for Your Champion. A quick blessing to Star Stuff, Glory Be! Amen, etc., etc., as circumstance and time allow. I am on my way with Plan B. This time I’ll give at least cursory consideration to the downside. No time, forget that. Must act. I flee miserably toward the large stone. I will make my stand at the stone and try pouncing with my shield. As if choreographed by a dancer, I leapt through the air with shield at my chest, knocking the Ninja tortoise down and trapping it below the inverted shield. I placed the stone, now close at hand, upon the shield to keep the devil trapped. My plan worked! Wait, the tortoise digs furiously in the meadow soil to escape the edges of the shield. It wrestles violently and emits muffled grunts that increase in volume and intensity. It is raging below the shield and bouncing the stone as if a mere pebble. I add my weight to the shield and thump its clawed feet as they appear from beneath the shield. The devil’s rage subsides finally as my efforts to contain it are successful. I have finally captured the Ninja Tortoise! Now I need to plan a means of domesticating the beast. I have plenty of time to think as I lie upon the shield. While I contemplate what to do next, the little terror’s tongue is poking out from under the edge of the shield – it is lapping up the blood flowing over the shield from my shredded forearms! All the while it snorts in satisfaction, gleefully enjoying my injuries. I do not think this will be the relationship I’d hoped for.